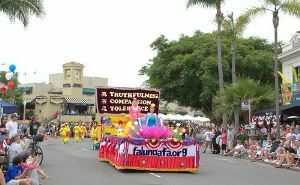 Only July 4, 2015, San Diego Falun Gong practitioners took part in the 4th of July parade in Coronado island, across San Diego Bay from downtown San Diego. Among over 100 participating groups, the Falun Gong group from San Diego was the only Chinese group. They have taken part in this parade for over 10 years.